We all know that the rise in gas prices is pushing some drivers out of their cars and on to public transit. And those of us who ride buses and trains are already experiencing the costs of that transition. It's tougher to snag a seat, for one thing, and everyone else is feeling a bit more snug. The Chicago Transit Authority has a better, more egalitarian idea . Get rid of the seats altogether. The Trib is reporting that the CTA will soon start experimenting with seatless trains during rush hour. Efficiency fans (efficianados??) will rejoice, but I'm not so sure about the rest of us. Ridership is on the rise in Chicago, at least in part because seniors can now ride for free. Somehow, I don't think the seatless ride will be particularly popular with the voting senior set. It's amazing how we've come to accept low-comfort transportation as inevitable. 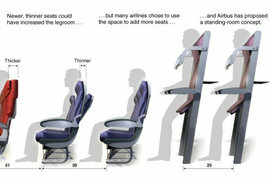 Air travel is becoming less and less pleasant, but at least you get a seat. For now. How long will it be before the FAA relents on it's nit-picky seat belt regulations? "Ladies and gentleman, welcome to Flight 509 from Los Angeles to Boston. Those of you seated on this flight are required to have your seat belt fastened for takeoff and landing. All other passengers must hold on tightly to the overhead straps. Please do not lean on the aircraft doors." DFO Gold in the game you may or may not notice. I know vitality is very tempting in Dungeon Fighter Online Gold. You may be feeling intelligence in Dungeon Fighter Gold. You are going to be getting crab pincers which like buy DFO Gold, depending on which server you are on. Let alone played [url=http://www.mmofuns.com]Tibia hacks[/url], the team told me to go brush with the strange [url=http://www.mmofuns.com]Tibia guild[/url], all the equipment [url=http://www.mmofuns.com]Tibia quest[/url], Grilled to me [url=http://www.mmofuns.com]Tibia forums[/url]. With a full set of BOSS jewelry [url=http://www.mmofuns.com]Tibia cheats[/url].